The NetworkView Function renders a visualisation of a graph. styles The id of a :IA_UserStyles node to override the default user styles for this NetworkView. No override. Any existing :IA_UserStyles node ID. Occurrence: When the user clicks a node. Occurrence: When the user double-clicks a node. Occurrence: When the user clicks a relation. Occurrence: When the user double-clicks a relation. Occurrence: When the user clicks an empty space in the graph. Occurrence: When the user double-clicks an empty space in the graph. More info on context menus. Imagine a NetworkView with an incoming trigger from a Neo4jQuery , and with two outgoing triggers to an HtmlView. On the incoming trigger, the #nodes and #relations function parameters of the Networkview are mapped from the event data of the success event of the Neo4jQuery. The NetworkView renders a visualisation based on this data. When an event occurs in the NetworkView, InterActor looks for matching outgoing triggers. Only matching triggers are executed. the event data contains type:"nodeClick"
Only when both conditions are met, so when the user clicks on a node that has a single relation attached to it in the current view, the trigger is executed. 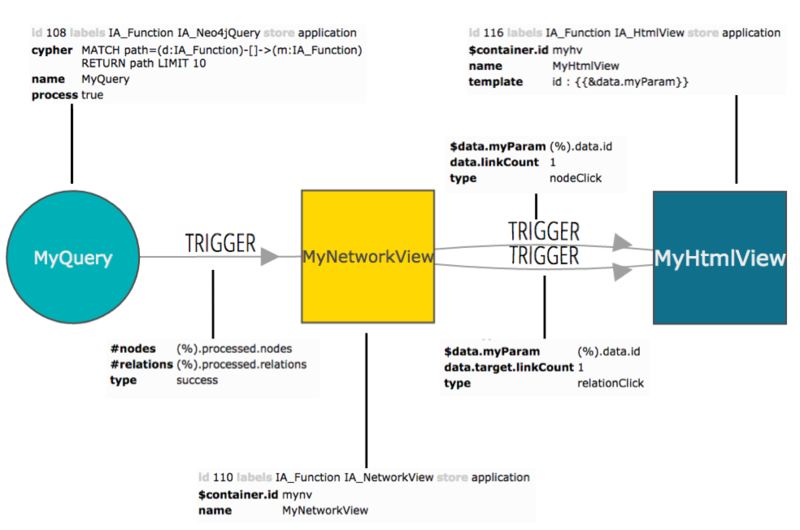 The trigger has a property $data.myParam:(%).data.id which maps the id from the nodeClick event data to $data.myParam which is a function parameter of the HtmlView the trigger is pointing to. The second trigger from the NetworkView to the HtmlView is executed when a relationClick event happens. This trigger only executes when the users clicks on a relation that points to a node that has no other relations. When executed, it maps the id of the relation that was clicked to the HtmlView. A more generic description of triggers is available on the Triggers page.